Sensor Mounting Hardware is often designed and manufactured specifically to meet the needs of the particular installation. This dual face-to-face arrangement is used for extended range differential expansion measurements. Speed and Thrust probes mounted axially onto a feed pump shaft. Differential expansion measurement using two probes with a convex ramp. Casing expansion measurement, using a modified cantilever sensor, fitted with an eddy current probe. 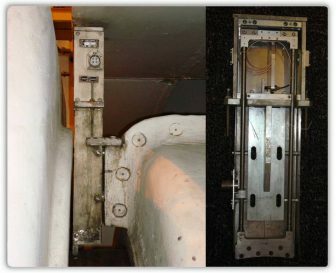 In supervisory systems provided by Zeefax, it is common for Sensor Mounting Hardware to be designed and manufactured specifically to meet the needs of the particular installation. 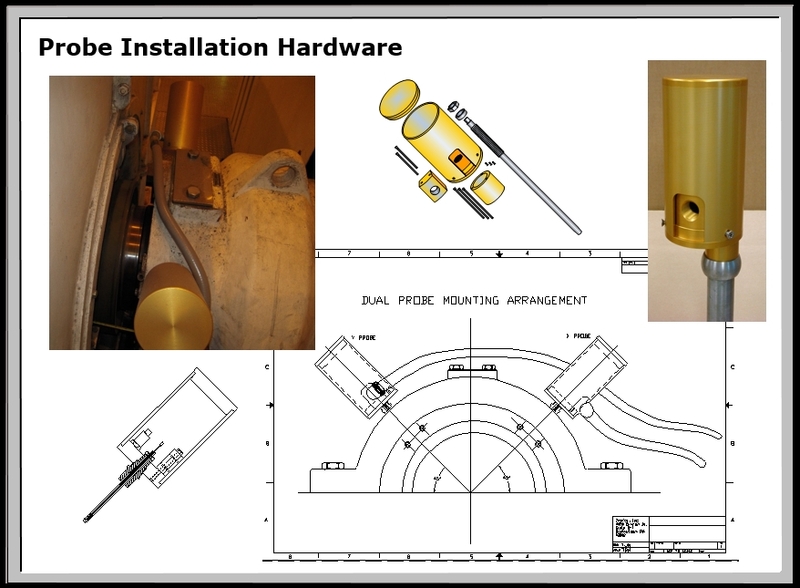 This is done to ensure that any mounting hardware supplied by us fully satisfies the needs of each project, but it should also be self evident that a series of standard designs and techniques are used or modified to complete the task. The single sensor version of the probe holder will typically support a non-contact eddy current probe. The probe is threaded into the variable length support tube – commonly called a stinger – which is inserted deep into the machine so that the probe tip is held close to and can observe the surface of the rotating shaft. The stinger itself is threaded through a base plate, which is held above the machine surface by an adaptor or spacer ring. The probe/stinger/base plate assembly is carefully mounted onto the machine first – taking care not to touch any part of the machine with the probe tip – and the probe is gaped and locked into place using the lock nuts provided. Externally, there is a can or cover piece which encloses and protects any internal wiring and probe connections, and an threaded adapter is provided to facilitate conduit attachment and termination if needed. When probe set-up is complete, the body is fixed in place and the top cover seals the unit. In some situations, and particularly when retro fitting new probes onto older machines where shaft riders or other transducers may have been removed, spot faces or flat surfaces may already be present on the bearing or machine case. In this eventuality, additional adapter pieces may be needed, and these can be designed to suit by Zeefax. 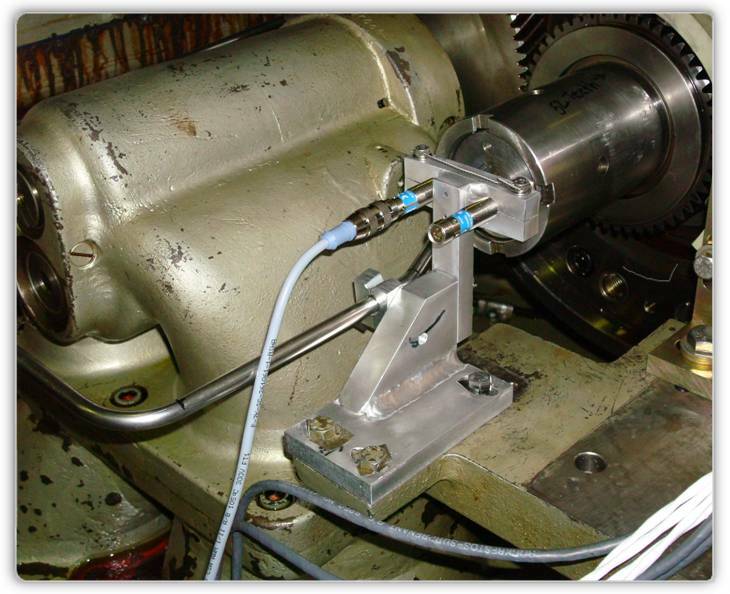 However in some cases it may be prudent to make use of existing shaft rider support tubes and assemblies to minimize any additional machining re-work required on and inside bearing cases for example. In this case, the existing components of the shaft rider assembly may be be re-engineered to accept any new probe stingers or holders which may be needed to complete the installation, and once again Zeefax can provide the mechanical design and engineering support to complete these types of modifications. In a modified shaft rider assembly, the stinger is typically held in place using a pair of lock nuts intended to maintain the probe-to-shaft gap, and ‘O’ rings can be designed in to provide seals against the oil pressure inside the bearing case. Usually, the original top covers can be used with re-engineered base plates to provide conduit attachment points. 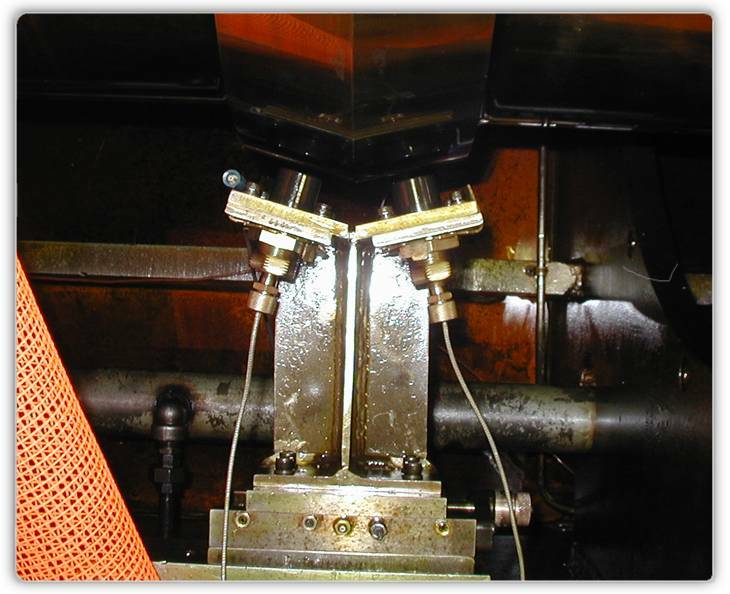 For installations requiring absolute vibration measurement, or where two sensors are required for other purposes, a dual probe holder will normally be fitted. The dual probe holder provides a single housing for a non-contact eddy current probe and a seismic transducer – either a velometer or an accelerometer. 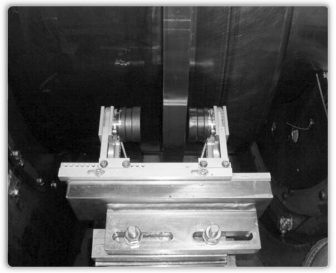 In this way, both sensors can be installed at the same point on the bearing or machine case, enabling relative, seismic and correct absolute vibration measurements to be made if desired. The seismic transducer typically fits directly to the base plate, threaded onto a flat spot face to ensure excellent vibration transmission to the sensing element. The VM600 online vibration monitoring systems typically used by Zeefax includes features which can combine and correctly phase match the two signals – one displacement and one either velocity or acceleration – thereby giving a measure of the absolute vibration of the monitored shaft within free space. 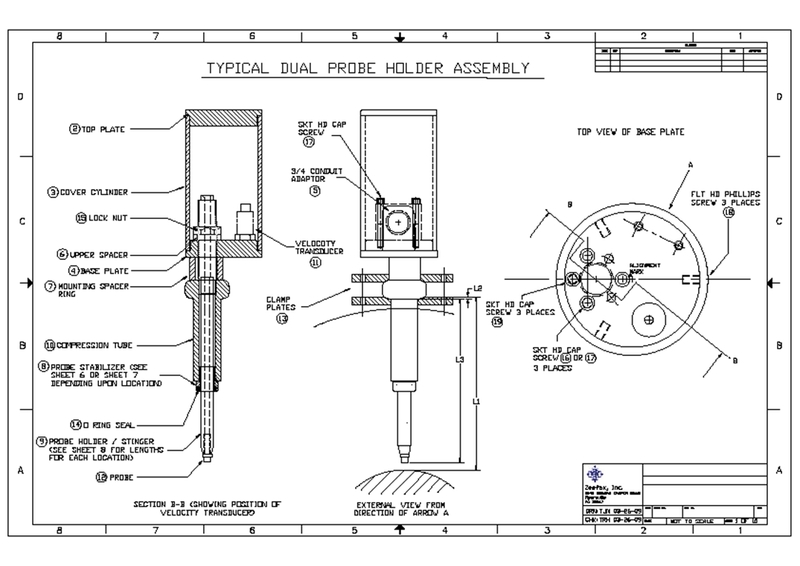 As before, the dual probe holder mounts directly onto the machine case using a variable length adapter tube if necessary, and provides mechanical protection for the probes and connections as well as a device for connecting conduit in the same way as for the single probe holder. Single or Dual Probe holders are available to suit almost any installation, and are often fully customized to suit each particular application, depending on height restrictions, mounting arrangements, insertion length, cable conduit types etc. Zeefax provide a design, build, calibrate and installation service for supervisory transducers, as well as periodic re-calibration, repair and replacement service to ensure that the most important part of any system – the probes – remain in calibration and in good working order. To compliment any sensor installation, fixtures, junction boxes and equipment cabinets are often required, to mount and mechanically protect drivers and modules and to ensure that the components stand up to the rigors each installation. Zeefax will design and build all parts of the system to ensure compatibility, reliability and trouble free operation. Based on a detailed survey of locations, available access and parameters to be monitored, the selection and mounting of sensors is a critical part of any system design, and careful attention to detail will result in well mounted sensors providing good quality data at the right time and at the right price.